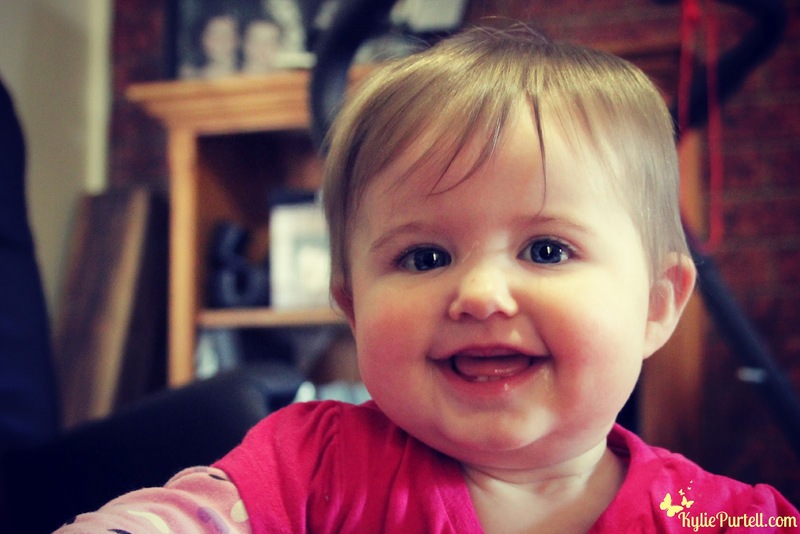 Here's my guide on how to baby proof... everything! These are pictures from our lounge room. The top ones are our coffee table and TV unit. The bottom picture is the bar area where Dave likes to dump all his stuff after work. That cardboard box with the arrow pointing to it? Filled with recycling and our current method of keeping Punky out of Dave's stuff and out from behind the bar. Surprisingly it has been quite effective! We have a gate sitting in the backroom though, just waiting to be installed here. 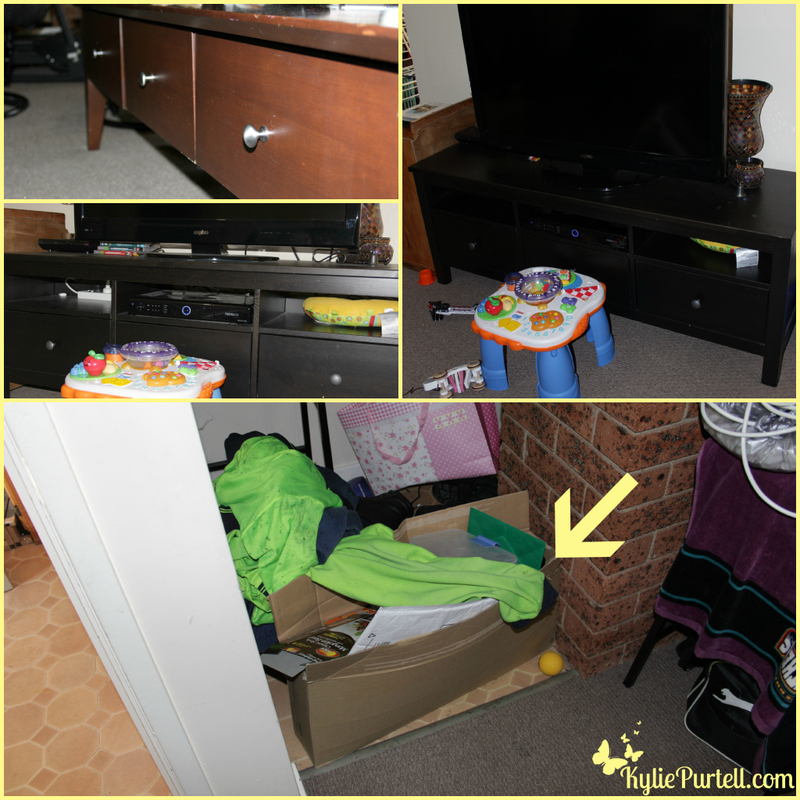 If you look at the TV unit picture you can see the Foxtel box in the middle cubby, to the left of that is a power board powering everything, and to the right, hidden by the yellow pillow thing, is a double adaptor with phone chargers. 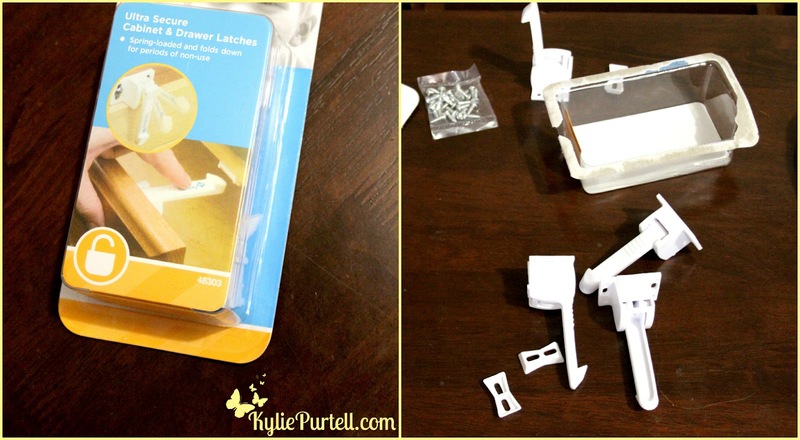 We set off to Target and stocked up on heaps of these cabinet & drawer latches to put on all the drawers in the lounge room, as well as the draws and cupboards in the kitchen. The beauty of these ones is they fold down once you don't need to use them anymore which will be handy when we no longer need them for Punky but will probably then have a baby who won't be far off needing to be kept out of drawers. They were pretty cheap too so we stocked up. We also got some straps to anchor the TV to the TV unit which were also pretty cheap, under $20. All in all I don't think it was too hard to install the latches, but then again my only job was to keep Punky occupied and out of the way while Dave strew bolts, screws and power tools all over the lounge room so I'm probably not an authority on that. During the week I am going to do some re-arranging of kitchen cupboards as well to move baby-friendly stuff into baby accessible places and the not-so-baby-friendly stuff to baby-unreachable places for that extra piece of mind. Most rooms in the house have been pretty easy to make baby proof and those that aren't, well, I just shut the door and don't let her in there. I think we have thought of most things, the only thing that has us stumped is what to do about the cubbies on the front of the TV unit (first picture). Punky just loves pulling at the cords and power board and fiddling with the Foxtel box and I have to watch her like a hawk but I'm not sure what we can put there to deny her access. So over to you guys...any suggestions? And any hints on things you ended up having to baby proof that we might not have thought of? Oh she is super cute. We installed the magnet child proof locks on our kitchen cupboards. It was really funny watching visitors trying to unlock them. Lol, I remember going to my friends house and they have baby-proofed all the drawers and I couldn't get in to them, I gave up. Will have to remember to let visitors know. That cheeky grin never leaves her face, makes her look as though she is always looking for mischief...which she usually is! I never thought about anchoring the TV! oh boy. Where do you get a flashlight helmet like that...so useful! I hadn't either until I read something online about kids being crushed by them and figured coz our TV unit was so low we better do it just in case. I'm not 100% sure where h got it from, probably a fishing shop as he using it primarily for when he goes fishing at night. Oh, it's all fun and games when they get mobile and too clever for their own good! I had forgotten that stage - we're now at the conversation stage. We have lots of things baby proofed, but for the most part if we tell her not to open a drawer she stays away from it. I wonder how much longer that will last!? It's funny the stages they go through, Mia is definitely getting more and more verbal, and considering how much I took my friends all reckon she'll be an early talker...I'm hoping not! Considering she is well on her way to being an early walker I don't mind if the back-talk takes a bit longer! We did an initial baby proof and now he is trying to climb we have to do it again. It forces you to put things away - this can't be good! I know! I have to be so much more neat and tidy then I ever have been in my life! It sux! Not looking forward to the climbing, that would be hectic! Oh, baby proofing is a joyous time, isn't it??? It's funny you say that because it is the most concentration I have seen on his face for a while. It took him quite while to get the knack of installing those things but he got there in the end. hehe I remember when we babyproofed for our 1st.. man it was everything she got into!! Its so funny when friends come over - they have trouble opening cupboards and even opening the toddler gate into the lounge!!! I can't believe the stuff she gets in to, it's amazing. And just when I think she can't get in to anymore she does. Can't turn my back on her for a second! She looks FAR too sweet to ever do anything naughty... however, I'm sure she'll be up to all sorts of mischief any minute!! Great photos esp the one of her. The sweetest looking ones are always the naughtiest and she is proving that! Mum looked after her today and said she looked just like me when she was up to no good and I was a very naughty child so I have no hope! Well, well, well... look who posted a WORDY Wednesday hahahaha. Love the handy man pics, the look suits him, he should do it more often! I know! But it was the kind of post that just had to have words. I figured the post was my disclaimer of sorts though! Lol! He should definitely do the handy thing more often, this house would be in such better shape if he did and I would be much less stressed about the whole baby=proofing thing! I thought about moving them and putting them down behind the unit, but as they are the only plugged in to the only bloody power point in the room, and I need to get to the power board on an almost daily basis it's too much of a pain in the neck them being on the floor behind the unit so I am stuck. It's so friggin annoying this stupid one power point in every room house! Totally need to get my bro-in-law to install some new ones. Doors are not a bad idea, although I may have to ask his Dad or my step-dad, not sure if Dave has the skills for that just yet, he'd probably wreck the thing! She is gorgeous!! little rascals love to be into everything dont they, I have one that has just discovered she can open doors, I have lost two coffee cups already. Aww! How fun! Maybe not fun for you, but for your little explorer it sure is. I'm Sarah. I'm stoppin by from Sakura Haruka's Wordless Wednesday. I don't have kids, but I've got 2 cats who pretty much do the same thing. They are both 2 and the youngest has just figured out how to get on the counter. You can see a major difference in her attitude, she acts all confident now. You can tell she's proud of herself. Anyway, gotta love 'em. My blog is Skylar Magazine. Would love for you to stop by. I'm following via GFC, Facebook and Twitter.